I have been wanting to share this book with all of you for awhile now, but life happened. I've been busy with kid's homework, baths, and early bed times. But - we are here now and I'm so excited to share some inspirational goodness with you! 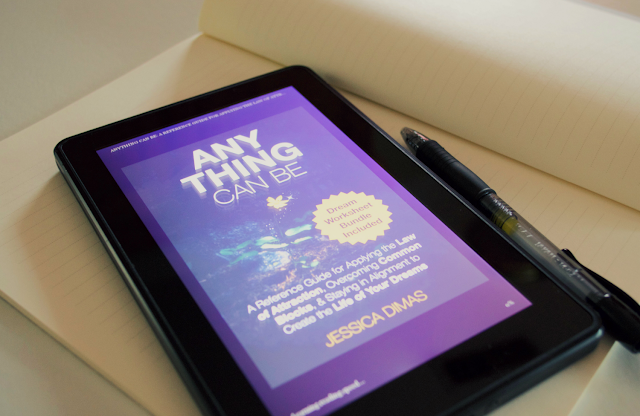 Jessica, who writes her own blog 'Pig & Dac' wrote a book! I've been following Jessica and her blog for a couple of years now. She was one of the first bloggers I ever found when I became a blogger myself. 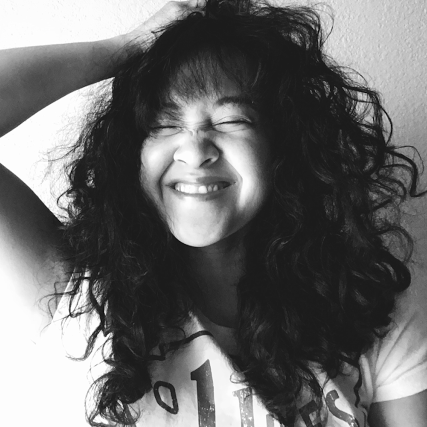 I instantly felt connected to her as I fell in love with her blog and writing. All of her posts are extremely inspirational, and helpful in many ways - whether she is writing about being a mom, growing older, or being a writer - all of it helps me. So, I was excited when I heard she was coming out with her very own book! And - I do enjoy sharing all the things I love with you.. 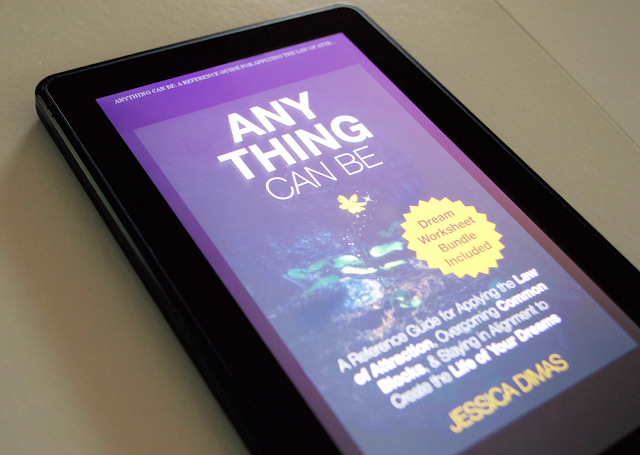 So, today I will be sharing all about Jessica's book - Anything Can Be: A Reference Guide for Applying the Law of Attraction, Overcoming Common Blocks, and Staying in Alignment to Create the Life of Your Dreams. "So I gently began focusing my attention onto a reality that I wished to experience - one with more abundance and joy." 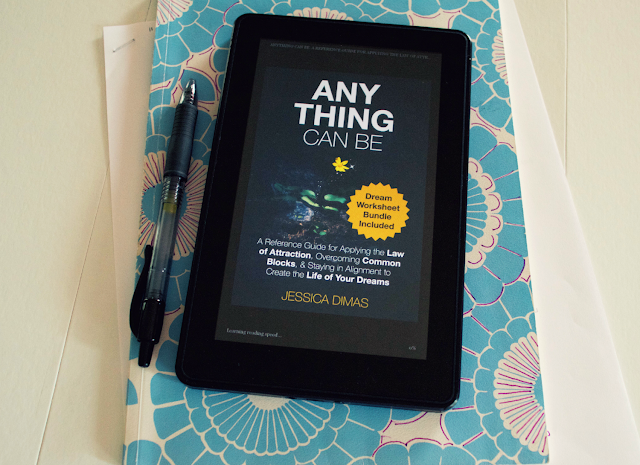 Amazon Summary // Anything Can Be is a condensed, no filler reference guide for applying the Law of Attraction every day in order to create the life of your dreams. In this guide you will learn the six most important steps for manifesting your goals and desires, as well as how to overcome the most commonly experienced emotional blocks that hold you back from everything you want. Putting the Law of Attraction into action requires daily intention, awareness of our thoughts, as well as remaining conscious of who we are and what we truly want in life. There isn't anything you can't be, do, or have that you truly desire. 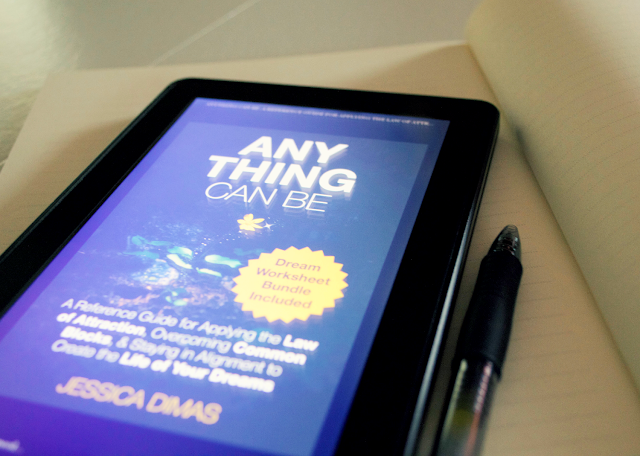 Anything Can Be and the Dream Worksheet Bundle are your tools to begin effectively putting the Law or Attraction into practice and manifesting the life you've always wanted to live. This book came into my life at the exact moment I needed it to. I was feeling completely lost and alone. My oldest children were off to school, and I was left alone during the day with my son and a little bit more time on my hands than before. It was nice at first - but then I started to wonder what I would do when all 3 of my children were off at school during the day? I wasn't sure who I was besides a mother, and I had a sense of what my dreams were.. but I wasn't sure what exactly I wanted to do with my life outside of my children. I was lost and afraid to chase anything, and Jessica's book helped me overcome a lot of my issues within myself. She immediately pulled me into the book, right from her introduction. She made me feel less alone and more hopeful that there was actually a solution to my feelings. You feel inspired as soon as you read the first quote and it only continues throughout the book. Anything Can Be is not only relatable - it is personal. You can feel that everything written in this book is coming from someone who has felt the same way you are feeling at that very moment. It's not coming from a doctor listening to your problems - it's coming from a person who has done the things she is writing in her own book, and sharing how it has actually helped her in her own life. It's the perfect balance of real stories, inspiration, and actual facts - you are never left feeling overwhelmed in your own thoughts. These are good ideas to help anyone, no matter how different you/your circumstances are. Anyone can read this and feel inspired. 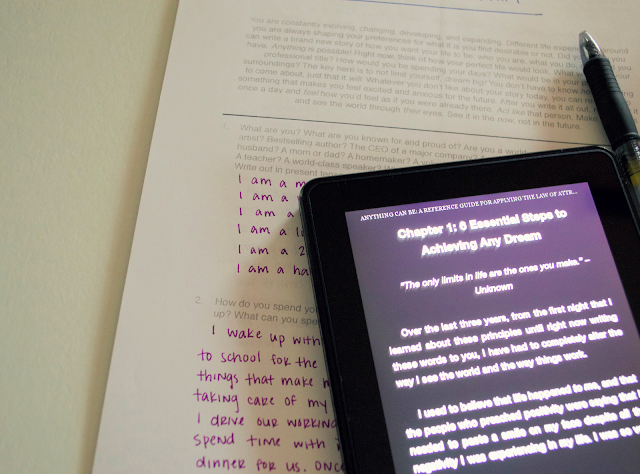 Included with the book, there is a worksheet bundle - which I love! They are extremely helpful. Jessica does a perfect job at listing steps and follow up information to help you within her chapters, in order to help you succeed. They are easy to download and print off - I also kept a journal handy as I read, and it worked out well for me that way. Anything Can Be truly helped improve my life. I hope you believe me when I write that, because it's true. One of the things that really helped me from Jessica's book was the part where she talked about letting go. It has always been hard for me to let things go, and it's hard for me to forgive myself - the one who has hurt me the most. With Jessica's help I am slowly taking the steps to forgive myself and others around me. Anything Can Be has opened up my heart to new things/ways to continue living my life as happily as I can. I am truly grateful for that. Even if you feel like you don't need much inspiration in your life - things are going well - Anything Can Be can help you stay on track in order to continue with your happy life! It's a steal to get Anything Can Be at this price, and don't forget it comes with NINE worksheets! Here's to inspiration and reaching our goals in life.